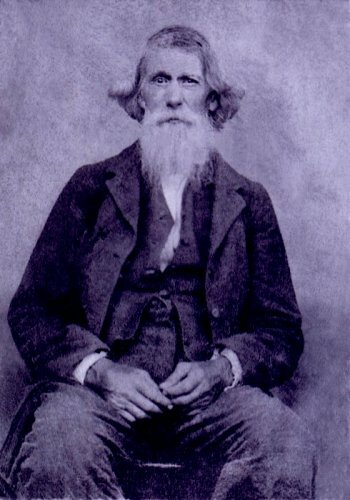 Caleb Oliver Latty, a native of Hall County, Ga. born in 1820, enlisted in "Hopkin's Rangers" Co. C, 24th Battalion, Georgia Cavalry in July 1863. He was transferred to Co. D, 7th Regiment, Georgia Cavalry when it was organized. His oldest son was Berdine D. Latty, also in Co. D.
In January 1865, he was sent to Georgia on a dismounted furlough to get a horse. Private Latty was cut off from command by Sherman's army and was still in Georgia when General Lee surrendered. He was captured on May 8, 1865 at Athens, Ga. Captured at the same time was his second son, C.C. Latty of Co. K, 11th Georgia Cavalry; his nephew, John E. Culpepper also of Co. D, 7th Georgia Cavalry. They were all paroled the same day and allowed to go home. 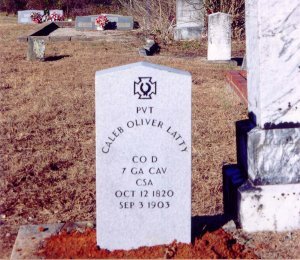 Private Caleb Oliver Latty died in Hall County on September 3, 1903 and is buried at Timberidge Baptist Church Cemetery also in Hall County, Ga.
Merriday H. Culpepper, of Co. D, 7th Georgia Cavalry, was another of Caleb's nephews. Contributed by John Latty, GG Grandson of Caleb Oliver Latty.